Last night at the EY Entrepreneur of the Year Southern Region awards, two of international payments company Airwallex's founders had their vision and business acumen recognised. Co-winning the Fintech category, COO Lucy Lui and CEO Jack Zhang will now progress to the national finals, where winners will carry on into an international competition. 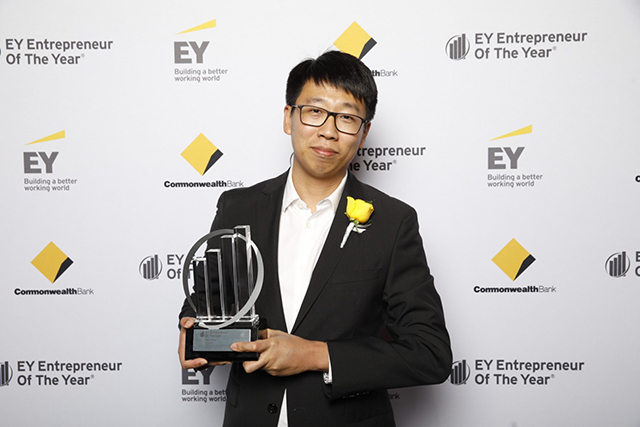 Hosted by EY, and judged by an independent panel of entrepreneurs and prominent business leaders, the Entrepreneur of the Year award recognises the Airwallex founders' entrepreneurial spirit, financial performance, innovation, national and global impact, personal integrity / influence, and strategic direction. This latest award win continues a slew of nominations and accolades for the fintech start up, with Lucy also nominated for the upcoming Fintech Leader of the Year award at the Women in Finance Awards - announced next month. Recently, Jack also took out the FinTech category of the highly contested YiCai Brilliant 10 awards in China. Most recently making international headlines for their US$80m Series B fundraising, Airwallex has secured US$102 million in total fundraising and has expanded to hold offices in four countries and employ more than 130 employees across the globe.